Size: 4.7" x 5.0" x 0.80"
Compared with the original design of the BA-20 introduced in 1986 this later model lacks the switch to select between battery and solar cells operation. The third generation of the BA-20 introduced in 1998 omitted the integrated clock. In Europe a very similar calculator was sold as TI-620. Don't miss the rare TI-10 Profit Guide combining similiar functions in a much smaller housing. 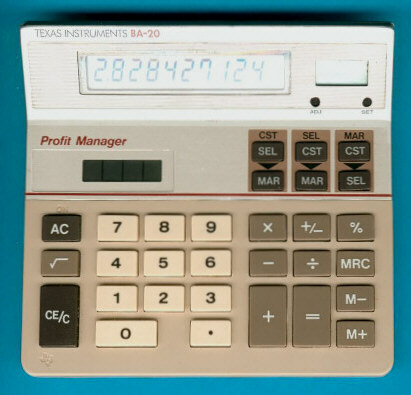 The BA-20 Profit Manager is featured in the Texas Instruments Incorporated sales catalog CL-1233 dated 1994. © Joerg Woerner, December 25, 2001. No reprints without written permission.